To date, tinnitus continues to be one of the most common otologic problems with agonizing and debilitating physical effects. Tinnitus is the medical term for the sensation of hearing sounds (usually noise or ringing) in your ears when no external sound is present. According to the American Tinnitus Association, 50 million people in the United States experience tinnitus. Even more surprising, only approximately 12 million actually seek medical help. With this information, it is our hope to shed some light on some of the facts and symptoms surrounding this common hearing disorder we know as tinnitus. Before we start it is important to note that tinnitus is not derived from one cause. Unfortunately, there are numerous causes that lead to tinnitus including, but not limited to, excessive noise exposure, head and neck injury, ear infection and most surprising stress! According to the website, RestoredHearing.com, many people who suffer from panic attacks, anxiety disorder, depression, or high-stress levels are prone to ear ringing caused by tinnitus. Although tinnitus is more common among seniors, it is often found in people of all ages, including children. Because of this shocking information, raising awareness surrounding the facts and prevention of tinnitus is important to spread for all ages. #1 Tinnitus is very common; about 10% – 15% of adults experience tinnitus. #2 Certain medications can cause or worsen tinnitus. Particularly in large doses, aspirin can cause of ringing in your ears. As well, some antibiotics can cause tinnitus as well as, hundreds of medications. #3 Tinnitus is not just for seniors. 1 in 5 teenagers suffers from permanent tinnitus. #4 Tinnitus is a non-auditory, internal sound, can be intermittent or continuous, in one or both ears, and either low or high pitched. #5 Currently, there is no cure for tinnitus. However, there are numerous treatments to manage life with tinnitus. Sound therapy by wearing a Lucid Hearing Hearing Aid is a common type of treatment. They amplify environmental sounds and redirect attention to those noises instead of the Tinnitus. It is important to note tinnitus is not a disease and in most cases, is not serious. If you have noticed a buzzing, ringing, or clicking sound (mild or loud) in one or both ears only you can hear that does not go away, you may have tinnitus. With this information, you should always yield on the safe side and seek the help of a medical professional. Losing the ability to hear is seen by many as an inconvenience, but science is beginning to show that hearing loss can profoundly affect health. Studies have found evidence that hearing loss can lead to the onset of dementia and worsen existing symptoms. The research is unsettling, but not damning. Despite the bleak news, it is not without hope. Increased understanding of the links between hearing loss and dementia can lead to solutions. It is important to note the difference between a link and a cause. Simply because someone suffers from hearing loss does not mean they will develop dementia. However, the study shows that seniors who have hearing loss are three times as likely to develop dementia eventually. Other studies add more credence to the dementia and hearing loss correlation. One found that living with noise pollution puts patients at a higher risk for dementia. The farther away from traffic-heavy roads patients were, the less their risk. How Does Hearing Loss Cause Dementia? The possible causes of dementia are still not concretely defined, but researchers have discovered many possible contributing factors. Researchers believe that the slow loss of hearing puts extra strain on the brain as it attempts to process unclear sounds. An overstressed brain is a weak brain, which is more susceptible to degeneration. Some scientists have also suggested other, less direct possible causes. There is a clear link between isolation and lack of socialization and the onset of dementia. Hearing loss commonly causes its victims to become more withdrawn, a known dementia risk factor. Can A Hearing Aid Help? Now that they have found the correlations, scientists are preparing for more studies to determine if a hearing aid can directly combat the onset of dementia or lessen the symptoms associated with it. As of yet, no one can definitively say that a hearing aid can help, but researchers are optimistic about what they will find. 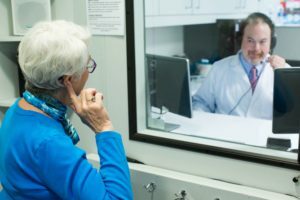 The leader of the study that found the correlation between hearing loss and dementia said: “Treating hearing loss could potentially help reduce the risk of cognitive decline and dementia…” Also, the increased risk of dementia due to social isolation is real, and a hearing aid will most definitely help with that. It may be distressing to find yet another potential cause of dementia, but this is in fact great news. It is better to understand than be left in the dark, and fortunately, effective solutions for hearing loss already exist.